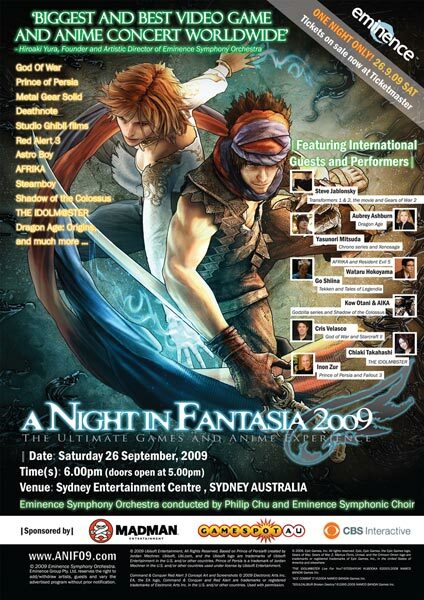 Those of you who have visited the Eminence Website lately should be aware that the website for Eminence’s A Night in Fantasia concert is up and running. My fellow Eminence staff writers over at Original Sound Version have already declared in their post that this concert boasts one of the most impressive groups of video game music composers from both the East and the West. If you’ve checked out the program on the ANiF website, you’ll also notice that it’s heavily slanted towards video game music. So for all VGM aficiondos, it’s a given that music from games like Ace Combat V, Soul Calibur, and Chrono Cross are worth the price of admission alone and that Chiaking’s appearance to sing a song from IDOLM@STER is just the icing on a very delicious cake. The question then is what this concert offers the anime fan. Well, the anime portion of the program, while not amazingly brilliant, is decent enough with quite a few good picks. I think the big surprise for me was seeing that the music from The Melancholy of Haruhi Suzumiya was going to be on the program and I’m going to guess based on the fact that because Shiro Hamaguchi is credited as the arranger, that we’ll be getting a piece from The String Concert of Haruhi Suzumiya. That’s not a major surprise since Hiroaki Yura, Eminence’s founder, also performed at the Haruhi concert in Japan. I’m also not too surprised to see Hisaishi’s compositions for Studio Ghibli’s films either since they have been performed in the past and the melodies themselves are well-known given that Miyazaki’s films are relatively mainstream (as mainstream as anime can get currently anyhow). So while they’re not getting a bigger cross-section of anime music out there, the series/movies from which they’ve picked have enjoyable music (moreso than your average anime soundtrack), so in that regard, it should make for a good concert. My only regret is that I’ll miss out on it since I don’t see myself traveling to Australia in the very near future. The concert is scheduled for September 26 and if you’re planning to go and want to secure your tickets, just check the ANiF website. I got my ticket few weeks ago, although I will be going by myself. If anyone is going keep a look out for a short Korean bishounen in reserve A area <(o.o<). Not sure if I want to write anything about it on my blog after the performance though since I don't enjoy writing about music as much as I listen and play. Maybe I'll do the amazingly generic summary+impression format report, but I'm sure there are more passionate people willing to cover it thoroughly. Hmm for some reason my comment got eaten up. Anyway I’ll be going alone, so keep a look out for a small Korean bishounen (?!) in reserve A area if anyone is going. I don’t enjoy writing about music as much as I listen and play, but maybe I’ll do the generic summary+impression for the sake of report in my blog, although I’m sure there are more passionate fans willing to cover it thoroughly. Video game music is definitely enough reason to go already. Too bad it’s not Ace Combat Zero Music. Metal Gear Solid 3 should be good. Awesome! Looking forward to getting a feel for the concert vicariously then! Yup, here’s hoping for a concert in the States. You’d think that with half the composers coming from the U.S., that there might be one over here that’s in the works. I practically almost got chewed out by my dad for using the credit card and blowing it on the ticket, but when I told him I was attending an orchestra, his tune changed somewhat, so to speak, as if thinking I had become a cultured person or something. Heh. Stealth spending! I totally approve of that measure and it should serve you well in your goal of kidnapping a loli. Also, bonus points for being able to drink out of Chiaking’s water bottle (if they’re careless, ho ho). Wow this is so cool. Haven’t heard that there is a video game concert like this. I am so amaze. wow.